I can hardly believe that only a few months ago I was thrilled that there was a person in the Presidential race with the same last name as my first one. I was prepared at that time to fatten up on the succession of glorious headlines that would elicit the mistaken impression that I am indeed one hell of a very cool and dynamic guy! 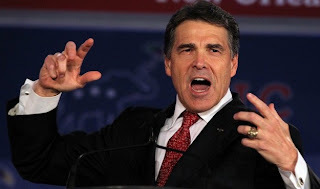 Will somebody please get this guy out of the race before he does any more permanent damage to my psyche? In the meantime, I'll focus my self-deceptive and delusional attentions on headlines about Katy Perry. Heck, not only am I MTV's Artist of the Year, I've just dumped that annoying Russell Brand! And, all my hits aside, ya can't help but dig the way this 61 year old Boomer dresses! Hot as Hell, ain't I? Perry, this is a lovely picture of you. You've certainly changed, but I'm glad to see you've kept your long blue hair. Please don't run for public office. It would ruin you. Thanks, but it's a toupee. Oh Christmas Tree, Dead Christmas Tree!